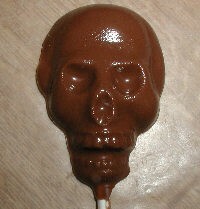 Use skull molds to make deliciously scary Halloween treats for the kids this year! They're inexpensive and easy to use and add extra fun to the season. What could be cooler to kids than something as gross and gruesome as eating body parts? 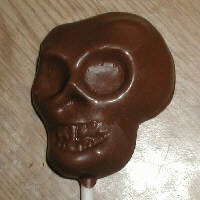 You'll be the favorite mom or dad in your neighborhood if you produce something as extraordinary as candy that looks like a chocolate skull, skull and crossbones, chocolate brains, eyeballs, and more. There are two places I go to find good quality molds in all different shapes and styles. Chocolate molds are easy to use, no matter if they are lollipop molds, pretzel molds, cookie molds, or just plain chocolate candy molds. All you have to do is melt the chocolate and fill in the mold. Of course, you can get fancy and make it a lot more fun by using colored melts and paint brushes to 'paint' in all the details before filling them up the rest of the way with regular chocolate. That makes a great creative and fun activity at a Halloween party or Harvest party. 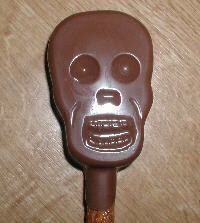 There are easy to follow instructions on how to mold chocolate candy if you've never done it before. So, what are you waiting for? 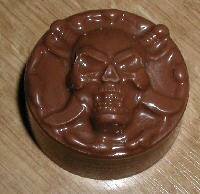 Head on over and get yourself some skull molds and a couple of other varieties and get started. You'll find pumpkins, skull and crossbones, ghosts, eyeballs, brains, spiders, and scarecrows, just to name a few. You don't necessarily have to use these gruesome ideas for Halloween treats. I can well imagine that many kids would be thrilled to have a scary party any time of the year!